The topic of hypothyroidism and anxiety is beyond complex. Trying to consume everything at once would be like trying to drink from a fire-hose. Instead, this post will be divided into parts as we peel back the many layers of anxiety and show you how you can overcome it. Before you continue, bookmark this page now because you’ll want to return to it later. …that’s almost one in every three. That’s the number of hypothyroidism sufferers I’ve surveyed who suffer from anxiety and panic attacks. But it’s a topic that fewer are willing to talk openly about. So, it never gets the attention it deserves. Anxiety can occur without warning. And like a tornado, it can leave a path of destruction in its wake. Anxiety and anxiety related disorders can ruin relationships with friends and family. It can tear apart loving marriages. When it strikes, you can literally lose all control over yourself and your thinking. …being able to stay in control of your thoughts and not give in to irrational thinking. Imagine being in control of your emotions and not being overcome with fear and worry. But, it’s only when you can understand the underlying cause of a problem that you can actually fix it. Yet, the underlying cause of anxiety is very misunderstood. Many believe it be a simple matter of stress or adrenal fatigue. But trying to fix your adrenal glands alone isn’t going to solve your anxiety problems. 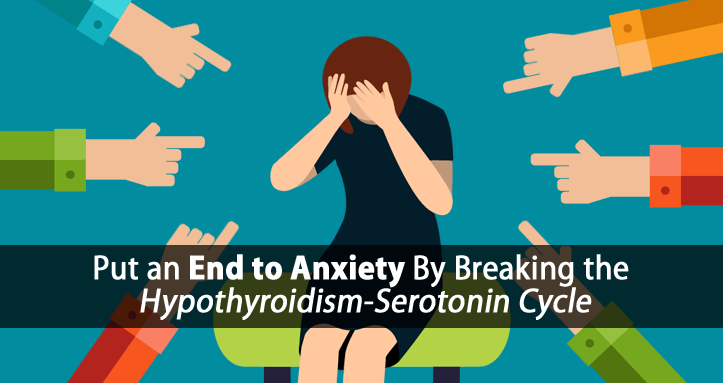 The first step in freeing yourself from anxiety is to fix your Hypothyroidism-Serotonin Anxiety Cycle. What Is Serotonin and How Does It Cause Anxiety? If you’ve ever heard of serotonin, you might have heard it called the “happy” hormone. If it were, then hypothyroid sufferers might just be the happiest people on earth. In reality, serotonin is a primitive stress hormone. In your intestines and blood, serotonin influences digestion, appetite, muscle contractions and more. In excess in your intestines, serotonin causes IBS, leaky gut, diarrhea, and nausea. In your brain, serotonin influences your mood, emotions, sexual desire, social behavior, and more. In excess (in your brain), serotonin activates your reptilian brain’s “fight or flight” response. Your reptilian brain (brain stem) focuses strictly on survival. It’s void of logic and rational thinking. When serotonin activates your “flight or flight” response, the result is anxiety and/or panic. And you’re left unable to think clearly and rationally. Lowering serotonin’s activity in the brain. Blocking your brain’s serotonin receptors. There are many ways to lower your serotonin naturally through diet, which I’ll show you in a second. But to lower your serotonin, you first have to understand why it’s elevated to begin with. Hypothyroidism and serotonin have a unique relationship. Hypothyroidism promotes the over-production of serotonin. And the over-production of serotonin further suppresses your thyroid. This creates one of many dangerous hypothyroidism cycles. And it’s dangerous cycles like this that keep you trapped in your hypothyroidism. All these effects of hypothyroidism are known to increase serotonin production. All these effects of serotonin are known to further suppress thyroid function. The only way to stop this vicious cycle is to break it. And we can help do this in many ways. 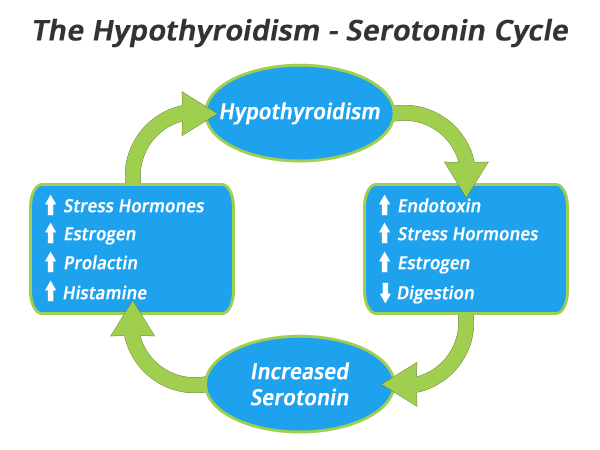 The best way to break the Hypothyroidism-Serotonin Cycle is to address it from every angle. So, here are five simple diet tips that you can get started with today. Most people today get most of their protein from meat. Yet, the protein in meat isn’t exactly balanced for optimal thyroid function. Muscle meats contain high amounts of the amino acid tryptophan. And in hypothyroidism, tryptophan is readily converted into serotonin. Using protein sources containing little tryptophan has been shown to help lower serotonin levels. One simple way to do this is to use more gelatin (collagen) in your diet, which contains no tryptophan. Gelatin also acts on GABA receptors in the brain, which can have a calming effect and improve sleep. Gelatin is a high-quality and anti-inflammatory protein source. And it has been used for thousands of years in traditional cultures. It’s also the most abundant form of protein found in your body. Today, many people consume gelatin in the form of bone broth. Yet, my clients tend to prefer an easier and simpler way. So, they consume it in the supplement form, collagen hydrolysate. This collagen requires no preparation. It’s a very high quality, anti-inflammatory, clean, and easy to digest protein powder. And it dissolves in both hot and cold liquids. My clients use it in coffee, juices, and many other healthy thyroid recipes. In other articles, I’ve written about the many therapeutic effects of coffee. I’ve noted many ways it helps to improve thyroid function and metabolism. Yet, this is one therapeutic benefit I’ve yet to discuss. As Dr. Raymond Peat points out, coffee (caffeine) helps to inactivate serotonin. And this is the reason behind some of coffee’s mood lifting effects. Caffeine also helps inhibit serotonin’s actions at the cell receptors in the brain. This helps to weaken the effects of serotonin on the brain. High-fiber foods tend to increase both endotoxin and serotonin production in the intestines. Studies show that hypothyroidism leads to Small Intestinal Bacterial Overgrowth (SIBO). And this bacterial overgrowth loves to feed on fiber. This increases endotoxin in the intestines, which further increases serotonin. High-fiber foods can also create a lot of friction along the intestinal walls. And it’s this friction within your intestines that also stimulates more serotonin production. Reducing your fiber intake can help to keep serotonin levels lower. But, not all fibers are created equal. There are some forms of fiber that are safe. So, it’s best to get your fiber from these foods. Raw carrots and cooked mushrooms have many therapeutic benefits. They have natural antibiotic properties that help to lower endotoxin in the intestines. Both have unique ways of helping to lower estrogen. They help speed transit time in the intestines. If you recall, both endotoxin and estrogen increase serotonin production. So, the use of raw carrots and cooked mushrooms can help lower your serotonin. Hypothyroidism is well known for causing blood sugar handling problems and hypoglycemia. As a result, stress hormones including cortisol, are chronically overproduced. And these stress hormones strongly suppress your thyroid function. Cortisol itself is a blood sugar regulating hormone. It acts by breaking down muscle protein and converting that protein into sugar. As cortisol breaks down muscle tissue, it releases the amino acid tryptophan. And as mentioned before, in hypothyroidism, this tryptophan converts into serotonin. Keeping your blood sugar up and stable is essential to suppressing stress hormones. And by suppressing stress hormones you can also lower your serotonin. When you can’t regulate your blood sugar, you must use your diet to keep it stable. One way to do this is to eat more frequent meals and snacks. Another way is to eat more of the right carbohydrates, like fruit. Gelatin protein can also help slow the breakdown of muscle tissue by cortisol. This helps slow the release of tryptophan and it’s conversion into serotonin. You now have five simple thyroid diet tips to help lower your serotonin and relieve your anxiety. And don’t forget, it’s not enough to use one or two of these tips. …being free of fear and worry are well worth the price of simple changes like these. Have you ever experienced that your anxiety significantly worsens during times of high stress? In Part 1 of this Hypothyroidism and Anxiety series, we covered the Hypothyroidism-Serotonin Anxiety Cycle. That dangerous serotonin cycle is, for the most part, the underlying cause of anxiety. Keep in mind that serotonin does directly activate your adrenal glands. So, over time, serotonin itself does drive adrenaline higher. Yet, when adrenaline rises, it acts as a gas pedal to your emotional state. You’re looking out the open door of a plane at 12,500 feet with a parachute strapped to your back. That’s enough to make anyone’s adrenaline shoot through the roof. If you’re not prone to anxiety (and you’re skydiving by choice), this increase in adrenaline will often result in a sense of exhilaration and excitement. Many people feel great when they are on an adrenaline-high. However, if you’re someone who is prone to anxiety, this increase in adrenaline will, more often than not, increase your anxiety 10-fold. Instead of jumping out of the plane, you’re more likely to breakdown in fear, thinking of everything that could go wrong after you jump. When you’re already prone to anxiety, adrenaline acts like a gas pedal, accelerating your existing anxiety to a higher level. In the same way that serotonin-blocking medications have been shown to successfully treat anxiety, the same goes for adrenaline-blocking medications. This is why beta-blockers are often prescribed for anxiety treatment. Beta-blockers work by effectively blocking the adrenaline receptors at the cell level, preventing adrenaline from activating your fight-or-flight response. While these medications are not necessarily helpful in the long-run due to their unwanted side-effects, they do give us insight into effective ways we can fix the underlying issue(s). In this case, there are many methods we can use to help lower adrenaline and effectively reduce or improve anxiety. If you suffer from hypothyroidism, then you also suffer from elevated adrenaline. This is because your body compensates for your hypothyroidism by over-producing adrenaline. While this does play a secondary role in anxiety, not all hypothyroidism sufferers will develop anxiety. But, you are much more susceptible. So, whether or not you suffer from anxiety, the recommendations below will still help you. Below you’ll find four simple ways to reduce adrenaline, which I commonly use with my clients. A healthy liver stores plenty of glycogen (a storage form of sugar) necessary to keep your blood sugar stable. A hypothyroid liver does not store glycogen efficiently. When your blood sugar drops, or your cells become deprived of glucose, your body secretes adrenaline to stimulate your liver to release glycogen. In the case of hypothyroidism, where your liver doesn’t store glycogen very well, this can lead to very high levels of adrenaline. This increase in adrenaline alone can quickly drive your anxiety very high. There are many foods that we can use to help your liver store more glycogen, but there’s another overlooked problem that we need to correct too. Your liver requires thyroid hormone (T3) to store glycogen. In many cases we have to use thyroid hormone (T3) to help break this cycle and help the liver to do its job. In turn, glycogen storage increases, blood sugar handling improves, and both adrenaline and anxiety often improve. Progesterone is probably the most anti-stress hormone that your body produces. Research studies show that with an adequate dosage, progesterone alone can effectively shut down the body’s stress response. In animal experiments it has been shown that animals can live normal healthy lives even after the removal of their adrenal glands, as long as adequate progesterone is present. Experiments also show that progesterone is very effective at relieving anxiety. I have found it to be very effective with clients. The quality and delivery mechanism of progesterone can make all the difference. This is why I use molecular progesterone oil with my clients. Restricting your sodium intake increases both adrenaline and serotonin. So, if you’re restricting your salt intake, then you may be pushing your anxiety even higher without even knowing it. Salt/Sodium intake has been a controversial topic for decades, until more recently, when continued evidence showing the dangers of salt restriction could no longer be ignored. Getting adequate salt in your diet is very important for numerous reasons, but keeping serotonin and adrenaline low is a big one. It’s best to salt your food to taste, although I’ve found that some clients still need significantly more. Most of my clients prefer more natural solutions to their health problems and prefer to avoid medications when possible. With that being said, there are safer anxiety medications, but that’s beyond the scope of this article. So, we typically first opt to try some amino acid supplements that work well for some, but not all. When it comes to anxiety, there are two that I generally recommend starting with. The first is l-theanine, which studies show to be very effective at stopping the stress response and improving anxiety. The second amino acid is l-lysine, which does not act directly on adrenaline. Instead, it acts by blocking the effects of serotonin. L-Lysine acts like a partial serotonin receptor 4 antagonist and inhibits serotonin-mediated intestinal pathologies and anxiety in rats. “An increase in nutritional load of l-lysine might be a useful tool in treating stress-induced anxiety and 5-HT-related diarrhea-type intestinal dysfunctions. Anxiety is a serious health issue that can literally take over your life. Understandably, we often look to quick-fix solutions to our debilitating health problems. Some of the solutions we’ve discussed so far are just that. They help to lower or block the effects of serotonin and adrenaline. However, hypothyroidism itself is a primary underlying cause of both elevated serotonin and adrenaline. So, it’s important to understand that while many quick-fix solutions may help in the short-term, they don’t necessarily fix the problem for good. 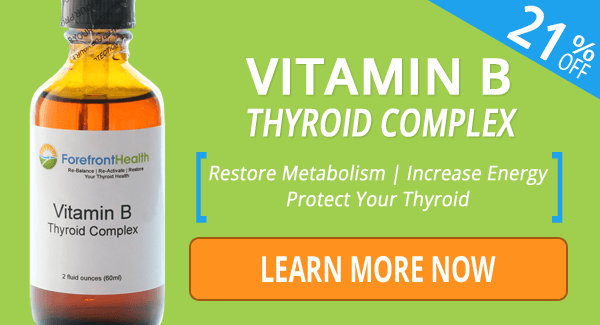 This is why using thyroid hormone (T3), from quality desiccated thyroid or T3-Only medication, to improve thyroid function is often the most important factor for normalizing serotonin and adrenaline over the long-term. Thyroid hormone regulates so many different functions and systems within your body that its negative effects can seem never ending. This is what makes hypothyroidism and anxiety such a complicated topic. Of course, thyroid hormone is responsible for regulating hormones. Yet, in Part 1 of this anxiety series we’ve also seen how thyroid hormone helps regulate neurotransmitters (and we’ve only discussed one so far, Serotonin!). Let’s not forget that thyroid hormone also plays the most important role in metabolism and energy production. We most commonly associate the effects of fatigue and lack of energy production with our body and muscles. Less commonly we associate the effects of fatigue and lack of energy production with our brain. In hypothyroidism, we can experience significant decline in brain energy production. This lack of brain energy is very commonly associated with anxiety. In hypothyroidism we see a switch from healthy oxidative metabolism (high energy production) to more glycolisis metabolism (lower energy production). Now most of these changes are well understood. However, the medical community refuses to acknowledge the dangers of excessive nitric oxide. This is in large part because of the erectile dysfunction drugs like Viagra, which depends on increasing nitric oxide to work. Of course, everyone must prioritize all aspects of their health, sexual or otherwise. But that’s a topic for another day. What is important is to understand the negative effects of nitric oxide when it comes to anxiety. Post Traumatic Stress Disorder (PTSD) studies show that brain levels of nitric oxide rise in response to severe traumatic stress. They also show that inhibiting the actions of nitric oxide in the brain can help reverse anxiety. Causing oxidative damage to brain cells. In the presence of polyunsaturated fats, reducing oxygen use. The end result is a severe decline in brain energy and often an increase in anxiety. Let’s look at some easy ways in which we can offset these changes in your brain and alleviate some anxiety in the process. Vitamin B3, specifically niacinamide, has some extensive benefits when it comes to anxiety. In fact, it will likely get its own dedicated part within this anxiety article series because of all its benefits. Today however, we’re only discussing niacinamide with respect to brain energy. The study below provides one example of how niacinamide enhanced brain energy metabolism. Mitochondrial function in the brain links anxiety with social subordination. It does so in part by reducing lactate and nitric oxide, while increasing the production of carbon dioxide in the brain. This cumulative effect not only stops the decline in brain activity from nitric oxide, it also strongly stimulates healthy oxidative (sugar) metabolism. In other words, large doses of niacinamide can speed up your use of blood sugar. For some this can result in a strong lowering of blood sugar. So, to prevent this from occurring some need to eat a significant amount of carbohydrates before using it. Another easy way to help lower nitric oxide in the brain and alleviate anxiety is with the use of the amino acid, l-theanine. L-theanine, a Component of Green Tea Prevents 3-Nitropropionic Acid (3-NP)-Induced Striatal Toxicity by Modulating Nitric Oxide Pathway. While there are many things we do to stimulate energy production, it takes time to restore healthy oxidative metabolism. So, anything we can do to protect ourselves during the process is helpful. A healthy, high energy metabolism requires sufficient carbon dioxide. Carbon dioxide both stimulates energy production while also decreasing lactate, which impairs brain energy. Bag breathing is something that we often use multiple times a day to raise blood levels of carbon dioxide. Simply breathing comfortably in and out of a paper bag through your nose can help. It shouldn’t be forced or uncomfortable. Take as many breaks as you need. While this builds up carbon dioxide levels, you will lose it over time as you breathe. So, bag breathing for a few minutes multiple times per day is most effective. Another b-vitamin that helps to improve brain energy is biotin (Vitamin B7). One of biotin’s primary mechanisms for this is through its ability to help reduce ammonia levels in the brain. Effect of biotin on ammonia intoxication in rats and mice. Not only did this study show the ammonia lowering effects of biotin, it also shows biotin’s ability to lower nitric oxide and glutamate. In some cases, there are other factors that can block brain energy. For example, there can be a degree of insulin resistance in the brain (commonly found in diabetes and the development of neurodegenerative brain diseases). In these cases, we can use an alternative fuel source to restore brain energy quickly. This is where keto-acids can help. Studies show that keto-acids (or ketones) can be used to fuel your brain very efficiently in times of need. They also show that this brain energy boost improves markers of anxiety. Now, we’re not talking about your body producing its own ketones. That’s a severe sign of stress. That’s your body trying to survive a serious nutritional deficiency that will shut your thyroid down quickly. We’re talking about getting a highly concentrated source of keto-acids from foods, such as potatoes. Dr. Raymond Peat has recommended juicing potatoes to remove the starch, leaving behind a keto-acid rich potato juice. This can be cooked into a pudding like consistency and eaten with plenty of salt to taste. All of the methods described here can help significantly with anxiety. An energized brain is one of the most important (yet overlooked) steps to improving brain function. 1. LeBlanc, Victoria. “Introduction to Anxiety Caused by Hypothyroidism.” Calm Clinic, 27 Oct. 2018, www.calmclinic.com/anxiety/causes/hypothyroidism. 2. Harvard Health Publishing. “Thyroid Deficiency and Mental Health.” Harvard Health, May 2007, www.health.harvard.edu/diseases-and-conditions/thyroid-deficiency-and-mental-health. 3. Foundation, British Thyroid. “Psychological Symptoms and Thyroid Disorders.” British Thyroid Foundation, 2018, www.btf-thyroid.org/information/leaflets/37-psychological-symptoms-guide. Besides carrots what about use of beets or burdock root? Hi Kae, we use the carrots specifically for the fiber and it’s ability to absorb excessive estrogen that is dumped into the digestive tract. Hi Tom and thank you for the tips. I LOVE your tasty way to survive! But need to ask – lots of your recipes combine dairy with fructose. A lot of information online that fructose blocks calcium absorption, looks like caffeine also. Hi nad, this has never been a problem for my clients. 1. High cortisol slows down production of thyroid hormone even further. 2. Drinking coffee within 60 minutes of taking your thyroid hormone reduces absorption. Also bamboo shots is not good for hypothyroid as it is goitrogenic which suppress thyroid function. Hi chinglem, I’ve answered your questions previously in another comment. However, I’d like to point out that coffee doesn’t contain cortisol and doesn’t raise cortisol. It actually lowers cortisol in a number of ways, including as mentioned, lowering serotonin levels. Here’s a low sample size yet interesting study on the stress effects of coffee. It shows that any stress effects from coffee are mitigated within 1-4 days of use. I was planning on explaining more with respect to coffee/caffeine in the article, but I’ve written on it in detail in many articles and don’t feel that repeating everything is necessary..
coffee is not good for hypothyroid as it suppresses thyroid function.i was taking coffee for three months continuously. i felt tired then i stopped.now i am feeling batter.also bamboo shots as suggested by you is not good for hypothyroids as it is goitrogenic.but butter ,carrots are very good. could you explain why you prefer coffee for hypothyroids? Hi chinglem, coffee is only a problem for those who purposefully deplete their liver glycogen, which is why it’s commonly misunderstood by low-carb advocates. Coffee itself (when used properly) actually improves thyroid function in many different ways. It has been shown to be protective against a large number of diseases and has been studied in detail to show that it extends lifespan. None of these are indicative of suppressed thyroid function, but they are of the opposite. I plan to write a more all-encompassing article on coffee in the near future to end the misinformation. Raw bamboo shoots are a problem, but when prepared properly, the goitrogens are removed. What are your thoughts on psyllium as a source of fibre? I mix a teaspoon of psyllium in a large glass of water and drink before going to sleep each night. Hi Marie, it’s not something that I recommend. Tom, I love your advise and its appreciated as I am hypothyroid. I want to get better but my focus has been on my dad, he is 80 years old with severe anxiety,.. its so bad he shakes.. he has been on all kinds of anti depressants. and drugs with no help. 2 years of suffering. He has no eyebrows and the fatigue it terrible…sleeps all the time Constipated….dry skin….. All his thyroid test come back normal but as I listen to you I hear you say it could be that. I am almost sure it is…do you think the anti depressants are a main cause of his anxiety? Any proofs to choose YOU to believe, not ”THEM”? And keeping proper vitamin D status is important as well. Thank you, but very weak proofs. Adolescent rats, 6 or 8 weeks terms, one injection etc. You said somewhere that even Omega-3 in short use can be good, (it helped my arthritis BTW). Who will check bone density in teenager(adolescent)?! How about 60 year old with lifelong fruits consumption?. I know it also depends on lifestyle, balanced diet, stress level, PUFAs,etc., etc., etc. But studies said nothing about kidney, liver, thyroid, parathyroid functions of rats, are they healthy or hypo? How about long terms? Any studies? And what does it mean ” even when using dairy and fructose together”? You’re admitting it’s not ideal? Maybe we need to be at least careful?. I did use it together and I do so now but it’ll not hurt me to separate if it’ll save my bones, I have 5 teeth left BTW(I’m 62! ), and 2 inch shorter! I was diagnosed with hyperthyroidism about four months ago, but all my symptoms were those of hyperthyroidism – weight gain tops the list. I was given medication – Methimazole 10 MG – to be taken twice a day. The doctor told me to return in one month and gave me a prescription for blood tests. Upon my return – almost six weeks due to time complications – the doctor informed me that my blood results show that I am now hypo. I was instructed to continue the medication, but now cut it in half. I was given another prescription for blood tests and to return in six weeks, that will be a week before the end of this month. Here is what’s bothering me: If I am now hypo, why does he let me continue take the medication for hyper? I didn’t want to argue with him because I felt vulnerable at the time and didn’t have any information about anything. Another thing, all my anxiety disappeared, but the weight gain has not. In addition to that, my hair is getting thinner and finer and I’m losing so much of it! Hi Eva, for those with true hyper-thyroidism, weight gain is not a common symptom. Excessive weight loss is. So, there’s a good chance that you were misdiagnosed from the beginning. It happens all the time. Hypothyroidism sufferers often compensate by over-producing stress hormones, including adrenaline. And adrenaline can promote symptoms of anxiety, elevated heart rate, heart palpitations, etc. Thyroid hormone (T3) makes us more sensitive to adrenaline. So, by suppressing your thyroid and lowering T3, you may experience less anxiety, but for the wrong reasons. It sounds like you’re now experiencing more hypothyroid symptoms as a result. Hi Nancy, not at all. It would increase serotonin. This information is very powerful! Is there anything else I can take besides gelatin as I am a vegetarian for the past 25 years. Would Agar Agar be a replacement? Also, how do I know I am getting too much fiber? is there a gram measurement? How can a vegetarian take in less fiber? Thank you Tom for this and other amazing articles you write! Hi Ingrid, agar agar would not serve the same purpose. There are some vegetarian friendly fish collagen sources. Thank you for your reply. I was wondering myself if I got misdiagnosed the first time. I just had a blood test yesterday and I will see my endocrinologist on the 25th. I am really wondering as to why he lets me take the same medication, although half the strength. In the meantime, I just read your article on the benefits of coconut oil. I am currently putting two tablespoons of it in my morning coffee. What do you think is the correct amount that I should take daily to get the best benefits? how many days will it take to end the anxiety circle, when doing all your dieting recommendations? I take gelatine from a Germany provider (name:Abtei ingredients for example:alanine, arginine, glutamine säure, his tin, theronin etc) is that right? As I understand there is no problem with fruit and dairy? Is 100 percent orange juice in package fine and I drink like 4to 5 glasses a day, think that is good? It seems that the more NDT I take, the more anxiety I have. My temps are still too low but my pulse is 100 or higher. Also I feel as though my brain doesn’t think right and I feel swimmy-headed. Do you think this is due to adrenaline or serotonin? Hi Cyndi, increased anxiety with increase NDT (T3), is typically related to elevated adrenaline. This is something that will be covered in more detail in part 2 of this article. I have had depression and am on the low end of normal thyroid (all the levels checked not just TSH), for which I take natural desiccated thyroid, I also have high parathyroid levels, in the lower range of normal calcium and low D, normal magnesium. I made the eggshell calcium recipe and ordered the A, D, K drops you recommend, hoping to bring the parathyroid level down by boosting the calcium level. The serotonin connection to mood and hypothyroidism is interesting, I had given up caffeine, as I was having anxiety, but maybe I will try adding some back in. Also, I had tried using powdered gelatin and had a really bad reaction to it, it caused severe mood swings and almost like a manic depressive state…took a few days to recover from it. I had tried various amino acid supplements previously as well and have very marked emotional reactions to them. Any idea why this would happen? Any advice for treating Secondary hyperparathyroidism? Hi Barbara, that type of response to gelatin is not common, but it and other amino acids can act directly on GABA receptors, which for most improves mood. To determine why you respond that way would require a lot more information. For example, I’ve worked with clients who previously used benzo drugs who often have a very difficult time with certain amino acids and other supplements that act on GABA receptors. Tom: Treating my hypothyroidism with Synthroid almost completely cured my anxiety and depressive symptoms. My doctor isn’t opposed to NDT but wants to wait since all my other labs and TPO antibodies are normal. My only leftover symptom now is chronic insomnia which has gotten worse in the 8 months that I’ve been on thyroid hormone. Will this protocol address this? Saliva tests show low morning cortisol which I suspect may need to be addressed. Really appreciate this article on anxiety which has been a severe issue for me and I’ve implemented a lot of your recommendations. I have found balancing my blood sugar with more frequent meals and snacks has made a significant difference and using coffee. I am going to give the amino acids a go but I have also tried introducing the desiccated thyroid you recommend but I don’t like how I start to feel within a few days of starting a small dose, I find my temperature drops, yet I feel very hot and sweaty, and produce bad body odour which I don’t normally suffer with and feel more tense and really tired, at this point I tried to increase the dose but I still didn’t like how I felt and so I stop. 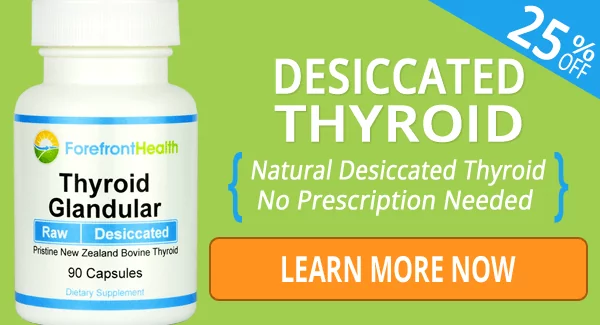 Are the symptoms normally or is it a sign I’m not tolerating the desiccated thyroid? Hi Stacy, if temperature drops when taking thyroid hormone (T3), then that’s a sign of elevated stress hormones. Often stress hormones have excitatory effects, so when we suppress them, we can feel worse and more tired initially. It’s most likely a dosage issue. Does depression (moderate) fit in this anxiety category also? Hi Margaret, yes it goes. Anti-serotonin medications/agents are also very effective for treating depression. Hi Tom, What about life without a thyroid and on synthetic T4 only due to cancer.? Find my hormones and adrenaline are all over the place. Quite frequently my T4 rises in the afternoon and it feels like my liver gives up converting to T3. rich information,yes not all fibers are created equal.Intestinal Bacteria produce butyric acid and butyric acid good for hypothyroidism.so need more research……. The right bacteria in the right places (large intestine) is good, but I’m referring to the small intestine here. As for help, we have a number of things that would help, including our Hypothyroidism Revolution Program. Unfortunately levothyroxine (and other T4-Only medications) is not adequate and often makes thyroid sufferers worse off. How do I order your protein powder? What are the causes of night sweats that have just recently excellerated. As for night sweats, it’s related to elevated estrogen and often triggered by stress hormones (low blood sugar for example). I address this using adequate progesterone supplementation with clients. Progesterone for hot flush and night sweat treatment–effectiveness for severe vasomotor symptoms and lack of withdrawal rebound. Thank you for sharing all of this great information! Thanks Tom, I am always encouraged to keep going when I read you blog posts. It’s no easy journey trying to heal hypothyroidism. We need all the help we can get 😀 Thanks for all your hard work. I’m referring to the liver glycogen section. I am taking metformin right now. Does this cause issues with hypothyroidism and anxiety? Thanks. Thank you for all your hard work, I love your easy to read approach. I have been trying for about 5 years now. I was diagnosed from my conventional Dr with ADD, suffer from pms, anxiety and mild depression since as long as I can remember. I have had success/relief with eating recommend foods, gelatin, pregnenlon, progesterone. I still feel something is missing and wonder if there is a l-theanine supplement you recommend? Ha, ha…no wonder I like and crave Gummie Bears. The traditional gummy bear is made from a mixture of sugar, glucose syrup, starch, flavoring, food coloring, citric acid, and gelatin.